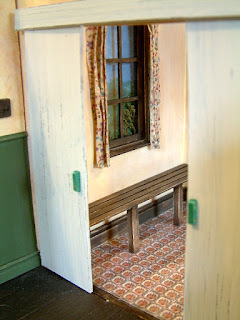 Nostalgia In Miniature Workshops: Lots To Tell You About Our Workshops! Ok.....for those of you who do not receive our Nostalgia In Miniature Workshops Newsletter....you can catch up with our latest workshop news on here. To say that both of us have been working our little socks off behind the workshop scenes lately is an understatement. Those of you who follow my KT Miniatures website will have seen that as from June 30th, I'm shutting temporarily for a few weeks whilst I undergo some surgery plus consequently undertake some downtime after in order to recuperate. However I have every intention of being back again as soon as possible by the beginning of August, if not before. It does mean that I will not only be offline throughout July but uncontactable by phone too....therefore please direct all communication about our workshops to Robin. 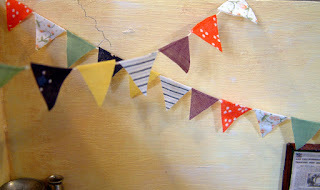 SEPTEMBER WORKSHOP - THE LITTLE VINTAGE HALL.....THE OTHER ROOM! We are delighted to say that the prototype for this next little project is now complete and we are beginning to turn our attention to making up the kits. A great deal of thought has gone into how this project is put together in order for participants to find it easy and enjoyable. The is project is actually quite versatile and varied choices can be made at several stages of the construction so you can make this to suit your needs. 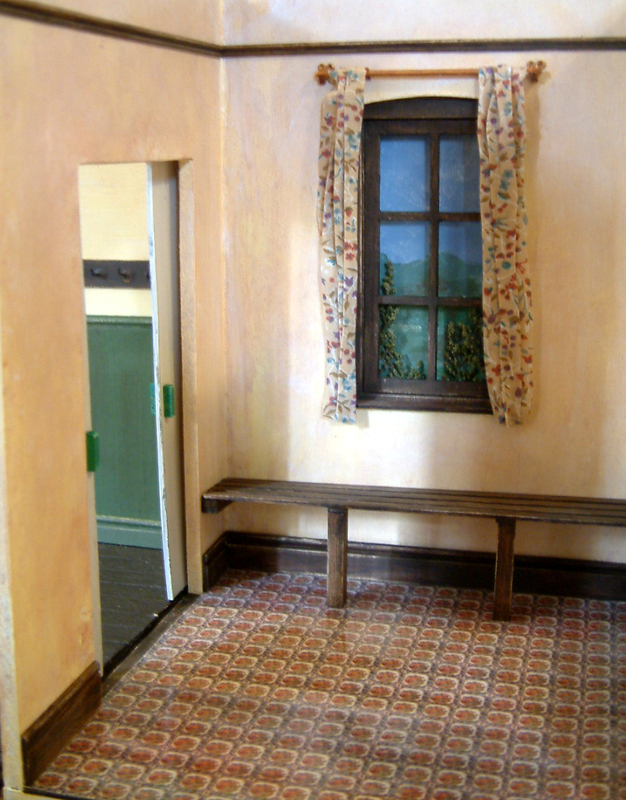 Through an arched window a painted 3D view will be seen. The flooring is a unique 1930s mock lino created especially and exclusively for this project however if you wish to have floorboards instead then materials will be provided for those too. The sliding doors do actually slide. For those of you who wish to set this scene in wartime, we will show you how to tape up the windows WW2 style plus include blackout material with curtains. This is an utterly unique project that can be attached to the previous project of The Little Vintage Hall if wished. Alternatively if you have not attended the previous workshop, this project can stand alone as a little scene in its own right. CURRENTLY WE ONLY HAVE JUST 2 SPACES LEFT. PLEASE CONTACT ROBIN IF YOU WISH TO ATTEND....PLUS FOR MORE DETAILS INCLUDING A DOWNLOADABLE BOOKING FORM, PLEASE SEE THE PROMOTIONAL WEBPAGE. OCTOBER WORKSHOP.....WHAT'S ON IN THE LITTLE VINTAGE HALL? We are delighted to announce that booking for this October workshop is now open. 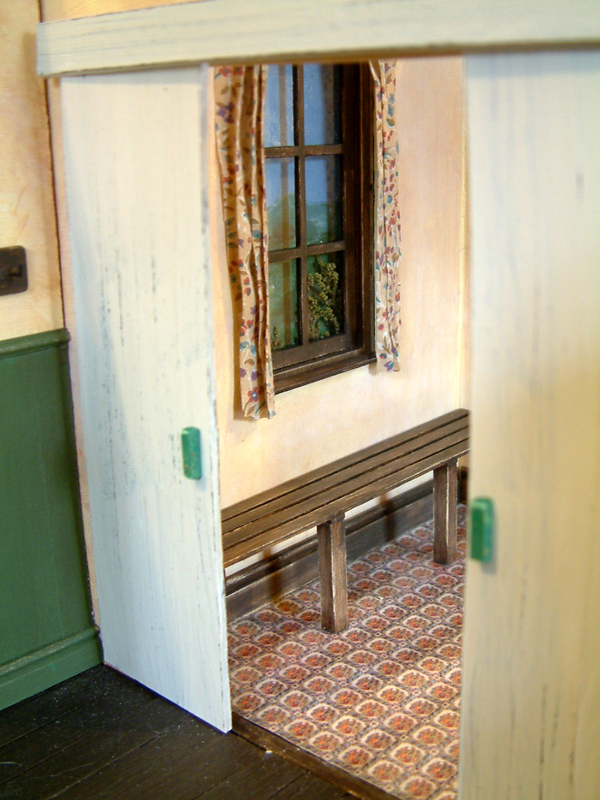 Although this is a perfect project to end The Little Vintage Hall Series on, the project is suitable for anyone who has never participated in any of our workshops before as these components are versatile enough to be used in a variety of settings. We will be giving you materials and teaching you how to make a 1930s tea urn, two wooden trestle tables, real fabric bunting, a card table and blackboard. 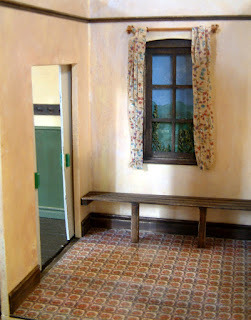 Plus you wil be making two loose mock cardboard table tops with cloths and given ideas to create a whole variety of scenes. We can accomodate up to 18-20 people for this workshop which is more component based therefore less intense so if there is a group of friends who wish to attend en masse....we may be able to accomodate you. FOR MORE DETAILS INCLUDING A DOWNLOADABLE BOOKING FORM, PLEASE SEE THE PROMOTIONAL WEBPAGE. At last we have been able to provisionally book the 7th April 2012 for our next all day workshop at Waterperry Gardens. Please note that this date is currently provisional but we hope to have written confirmation any day now. At the moment we are still in the early stages of planning the project but in order to tempt you....let's just say that we will be moving outdoors again....we think you'll like it! As before, spaces will be limited to 20. If you would like to place your name on a short list and register your interest in attending, then please contact Robin asap. Details will appear on the website very soon. Already, we only have a potential of 14 spaces left....as 6 people have reserved spaces. STOP PRESS!! COMING VERY SHORTLY (IN A COUPLE OF DAYS) FULL DETAILS INCLUDING DOWNLOADABLE BOOKING FORM FOR OUR ALL DAY CHRISTMAS SPECIAL WORKSHOP IN THAME ON SATURDAY 24TH NOVEMBER.......WATCH THIS SPACE!! !